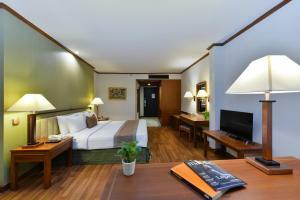 Providing air-conditioned rooms with cable internet TV, Aspira Grand Regency Sukhumvit 22 is well-situated a 10-minute walk from Phrom Phong BTS skytrain station and Emporium shopping mall. A 5-minute walk from Royal Benjasiri Park, Aspira Grand Regency Sukhumvit 22 is 4 BTS skytrain stops from Siam Square, Siam Paragon and MBK. 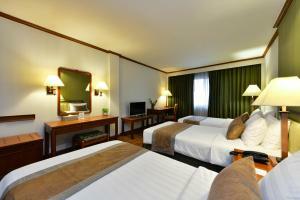 It is a 5-minute drive from Queen Sirikit National Convention Centre. 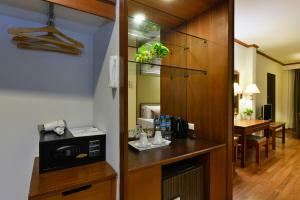 A cable TV, safe and tea/coffee maker are standard in all rooms. Ample workspace and an attached bathroom with a hairdryer are also available. 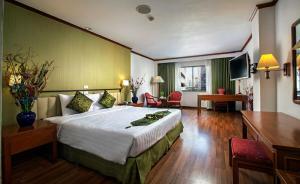 The hotel also has a business centre and laundry services. Hearty breakfast buffets are served in Palm Court’s casual setting. Please note that for extra beds, guests will be provided with a roll away bed. Offering added space and is located on high floors, stylish rooms are complete with a cable TV, safe and tea/coffee maker. A bathtub and an electric toilet seat are provided in the en suite bathroom. Largest room types features, this tastefully room is comprised of a satellite TV, an electric kettle and a seating area. Its private bathroom features a walk-in shower and an electric toilet seat. 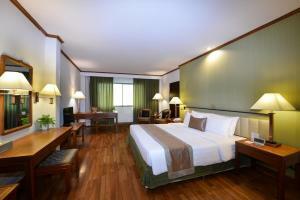 Rate: THB 1332.67 ... THB 4200.00; select dates below to get current rates. This triple room has a seating area, electric kettle and air conditioning. This room cannot accommodate extra beds. This family room has air conditioning, electric kettle and satellite TV. This room cannot accommodate extra beds.